If you thought Black Friday brought on the fights, those shopping arguments have nothing on the Thunder vs. Looker climax. The brewing battle between Freeland's rising hero against South Freeland's racist corrupter finally came to a head on Black Lightning Season 2 Episode 7. Metahuman powers were their weapons, the abandoned mall was their setting, and victory was on the line. This super-powered confrontation capped off a thrilling arc away from the cityscape of Freeland. I loved that both Anissa and Jefferson needed to work together to complete this mission. The pair still had the underlining tension that drove them apart, but they're a great team when they work in unison. For instance, Thunder dealt the final blow to Looker, but Black Lightning was there to support and handle the Sange. And, without Jefferson's help, they wouldn't have rescued the missing baby. Both played their parts to conquer the enemy. In times of crisis, we can rely on their noble character traits to push aside drama to do what's right for the greater good. Jefferson's shining moment was faking his captivity at the Sange's hideout. Surprisingly enough, his suit malfunctioning was the best thing that could've happened to him. He inadvertently lured the Sange into a false sense of security before unleashing his true power. That's the perfect battle strategy to get the upper hand. Jefferson learned a lot about Looker, their mysterious connection, and her ultimate goal out of that one capture. If they had continued their chat, he would've learned so much more about her past. While the Sange were "electrocuting him" in the restraints, he was probably laughing in his head. The shocks most likely tickled or recharged him. He was treated to a refresher while we got Cress Williams looking handsome and shirtless as ever. The psych-out gag was a bit cliche, and sure, I fully expected him to easily escape as a possibility. But, the reveal was well worth the surprise gimmick. Jefferson proved he didn't need a suit to fight his battles; he had all the right stuff to win it. Plus, the scene of him cradling the baby was peak adorableness. 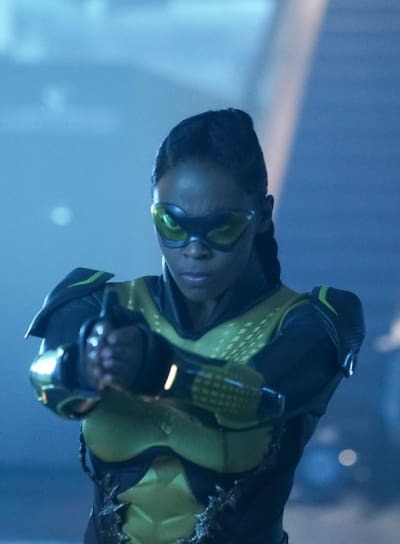 Anissa, on the other hand, let her fists do the talking during one of Black Lightning's best fighting sequences yet. As many astute readers here on TV Fanatic pointed out before, the effects of Looker's silver liquid would be no match for Jefferson and Anissa's electric abilities. The pair could easily electrocute the villain and call it a day. So, I liked that this fight relied more on physical aptitude than powers. We need more moments like this on Black Lightning. I believed that Looker would pose as a threat against the heroes and that this victory wouldn't be easy to achieve. Anissa and Jefferson were stronger and had better training, but Looker also had decades-worth of metahuman powers that altered her body. Anissa required many of her best moves to fight this psionic vampire before ultimately "staking" her. Which, by the way, was a fun subtle nod to the character from the comics. While Looker is a superhero in that continuity as opposed to being a villain here, the character did become an actual vampire (crossed with her metahuman abilities). 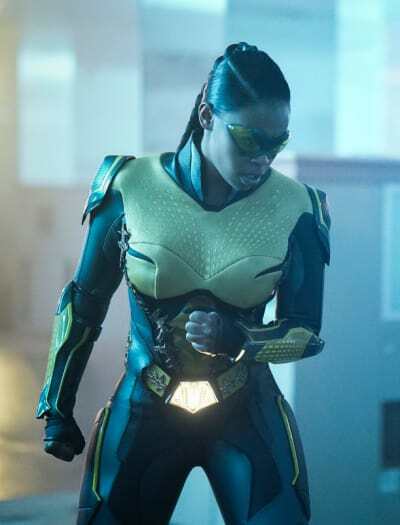 Black Lightning the TV show tweaked her origin to involve the liquid as her means of control (which is a shame because vampire characters infused in the real world are interesting). But, keeping some vampiric elements did help to connect the inspiration. Come on, how could they not defeat without staking her? Plus, Anissa defeating Looker was so rightfully satisfying after all the racism and prejudices she kept preaching. Jefferson had the strength of Thor (yes, I'm crossing comic book worlds here, everyone!) to stand back and stomach all her toxic words. She's a racist. She knows she's a racist, but her justifying it makes her even worse. 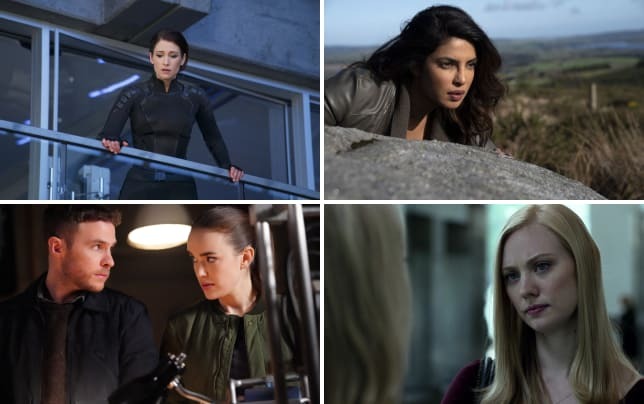 After all these years in television, not much can surprise us about what characters say. However, Looker throwing out the "minority privilege" line to Jefferson with all seriousness took the cake. Looker was the epitome of being a troll with her stubborn justifications. Thankfully, she'll no longer be able to inflict her segregated divide between the Perdi and Sange. Though, we'll have to wait and see if the A.S.A. does any strange experiments with the body; it might be too early to rule out the return of Looker. 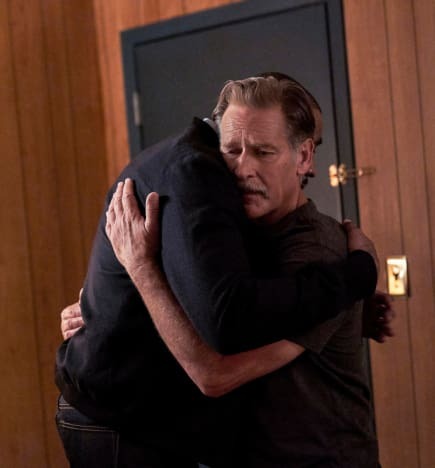 Gambi and Jefferson's long-awaited reunion warmed my heart. You could feel the love between these family members and the moment they felt complete again. Jefferson didn't care that Gambi kept this secret from him; he was truly heartbroken over the thought of his father-figure being gone. The moment Jefferson rushed over to pull Gambi into a hug nearly got me. The emotions were strong, the acting chemistry worked well together, and the music blended perfectly with a sad-but-hopeful vibe. This reunion created a beautiful and emotional scene. Black Lightning Season 2 Episode 7 wasn't just the third chapter in The Book of Blood, but it was the next big chapter in Khalil and Jennifer's story. Both teens took large positive strides in their development to become the characters they want to be. Khalil finally had enough courage to escape Tobias's control and determine that enough was enough. Even though Black Lightning Season 2 was openly building toward this move, this reveal still hit all the emotional points. Painkiller had set a line in the sand and he wasn't going to cross it. Thankfully, he never did before he left town, so we have some hope toward him having a potential redemption storyline. He never caved to Tobias. He could be a hero that would make Jennifer and Jefferson proud. In Jennifer's case, her coming to terms with her powers and making a stand in her life was the biggest breakthrough possible. Her revelation took weeks to come to fruition, and sometimes it didn't look like that change would ever happen. But, the journey paid off in the end by creating starting Jennifer on her next phase. Someday, she will become "Lightning" and she'll use her powers for good. From the way she showcased her energy ball to Khalil, she already had a firm grasp on controlling her abilities. Now, it's reaching the acceptance stage of being a metahuman that will make all the difference for where the character goes. Jennifer isn't at a place of loving herself or being proud of who she is. However, as for how Perenna put it, she could eventually get there with the right people and the right support by her side. Though, Perenna's words were very troubling regarding Jennifer's future. How powerful could Jennifer become? Could her fears and inner turmoil lead her to become a catastrophe that Thunder and Black Lightning need to stop? Perenna warned Lynn and Jefferson about the abilities she sensed. That type of foreshadowing isn't something we should ignore because it's the kind of dialogue we'll look back on that will come to reality. Even Perenna looked scared over the possibility. As mentioned before, Jennifer wasn't in the best emotional or mental state regarding her powers. Now that she's leaving with Khalil, she won't have her advisor to ground and reassure her. The breakthrough might not last long if things don't turn out well for her. More Anissa and Grace romance scenes! Kudos for this relationship getting back on track. Grace can't keep her affliction a secret forever; Anissa is going to find out sooner or later. She should probably share the truth with her before it's too late. The priest was so stubborn talking to Khalil. He's lucky that Khalil kept giving him a chance to leave; if it were anyone else from the 100, they wouldn't be showing mercy. Poor Aniyah! She suffered from so much loss, especially with losing both Deacon and her mother. Hopefully, now that Looker is gone, she can rebuild her relationship with her father and the babies. I loved Black Lightning's invisible suit mechanism! Bring on all the gadgets and special abilities, please. What did you think of "The Book of Blood: Chapter Three: The Sange"? Is Looker dead or will she make a return? What is going on with Grace? Will Jennifer and Khalil return to Freeland?